All those are wrong motivations to give. They stir negative emotions inside, ones that if left unchecked will eventually leave us jaded about the whole giving process. 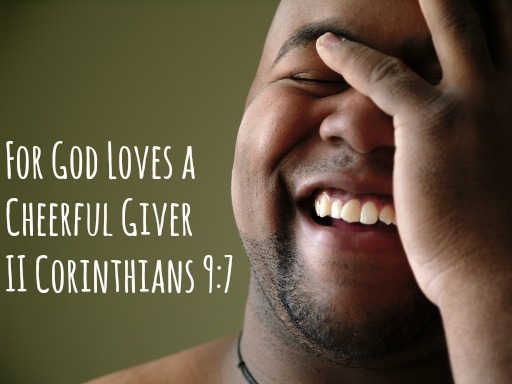 Instead givers are called to be cheerful. The Bible uses a funny (literally) Greek word for the adjective “cheerful” – heleos. It’s from where we get our word “hilarious.” Cheerful, hilarious givers have a mind that is ready to give with joyfulness. The passage makes it clear…cheerfulness is the mindset we should have. I’m not suggesting we give a hoot and a holler every time the offering plate is passed. Depending on the church, you might get some looks. But you sure can be giggling on the inside knowing the manner in which you are offering money is pleasing to God. He might even be laughing in heaven at your hilarious giving spirit. Questions: Is giving a joy to you…do you do it cheerfully? Have you ever been trapped into giving because of expectations? Out of necessity? Or reluctantly? Out of pressure? How do you keep the right attitude about giving? Great article, Brian! It has taken me years to get to this point where I finally “get” the giving. Of course when it comes to money, but also with everything else we can. Time, help, love, knowledge and so on. That place of giving something to someone else, understanding that it is not anyway entirely yours to start with and to therefore expect nothing in return. Veronica Paz recently posted…Fail to Plan or Plan to Fail? Nice article Brian. I give what God expects me to give. I know he is very understanding. Thus, as long as it’s out of love, I give at least something that I can give. For me, it’s not almost about money, but the thought of giving something and sharing it with others. I’ll admit, I’m not always the most cheerful, but I’m also never bitter. I give and I give sacrificially. Sometimes that causes me to think “wow I could be out of debt so much faster if…” But I’m never really going down the path of not giving. I need to work on following that “wow” up with “and I’m so glad I GET to give this to the Lord’s work”. Kirsten recently posted…What Should We Do About the Student Loan Debt Problem? Great perspective! I couldn’t agree more – giving unto others should bring joy. It reminds us that we are just a tiny spec in the grand scheme of things, and we have everything we need. In my opinion, giving is a physical profession of your faith. Not because you have to, but because you get to! We can’t afford NOT to give. Luke Fitzgerald recently posted…You’re in Debt, Stop Investing!